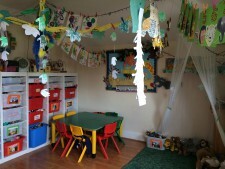 Our Cheeky Monkeys room for our 2s to 3s are grouped together by age and stage of development. To help develop health and well being, children are introduced to routines including regular meal time, rest times, indoor and outdoor play, and small group and individual time. Children are encouraged to be independant and to grow in confidence by giving the children access to a wide variety of toys and activities both indoors and outdoors. Key workers share information with parents about their child and work closely together with both child and parent to develop a secure relationship. Key workers work together to plan for each week to develop skills, individual needs and next steps for the children. Each child has a learning journey file which each key worker fills in on a regular basis to monitor their progress to follow the birth to three frame work. Children are encouraged to be independantly toilet trained. Staff work together with parents to ensure that this time is relaxed, fun and sucessful. Children learn to play together, share experiences, and develop friendship with each other and their key workers. Staff during the end of toddler 2 will encourage children to spend time in pre school settling in at thier own pace, getting to know other children and staff ready for thier transition to their new envirorment.